Thomas Jefferson,the American Pioneers, and Eero Saarinen (designer of Arch). 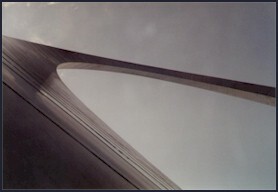 The Gateway Arch is the tallest man-made monument in the Western Hemisphere. At 630 feet, the Arch is 75 feet taller than the Washington Monument and over twice as tall as the Statue of Liberty. The Arch surpasses Egypt's Great Pyramid (450') in height. On a clear day, a thirty-mile panoramic view from 630 feet in the air awaits you. Each capsule holds five passengers and takes four minutes to reach the top. Did you know? 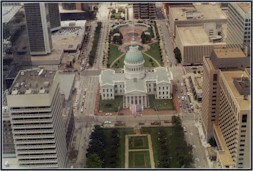 That William Clark, between 1816 and 1818, had a large two story house constructed ( one of the finest houses in St. Louis) on the grounds of the Gateway Arch near the spot where a grassy area called the "north triangle" is located. Millions of visitors pass this area each year as they walk from the Parking Garage to the Arch.